Coughing up blood (hemoptysis) can be a sign of a serious medical condition. Infections, cancer, and problems in blood vessels or in the lungs themselves can be responsible. Coughing up blood generally requires medical evaluation unless the hemoptysis is due to bronchitis. 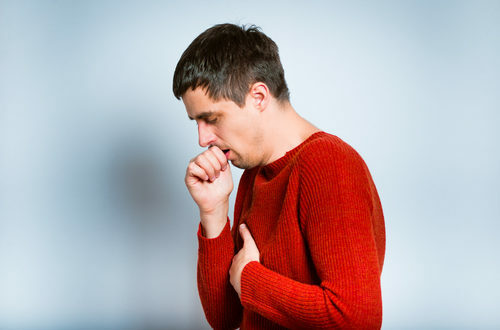 Bronchitis (acute or chronic), the most common cause of coughing up blood. Hemoptysis due to bronchitis is rarely life-threatening. Hemoptysis can also come from bleeding outside the lungs and airways. Severe nosebleeds or vomiting of blood from the stomach can result in blood draining into the windpipe (trachea). The blood is then coughed up, appearing as hemoptysis. In many people with hemoptysis, no cause is ever identified. Most people with unexplained hemoptysis are no longer coughing up blood six months later. History and physical examination. By talking to and examining someone who is coughing up blood, a doctor gathers clues that help identify the cause. Chest X-ray. This test may show a mass in the chest, areas of fluid or congestion in the lungs, or be completely normal. Computed tomography (CT scan). By producing detailed images of structures in the chest, a CT scan can reveal some causes for coughing up blood. Bronchoscopy. A doctor advances an endoscope (flexible tube with a camera on its end) through the nose or mouth into the windpipe and airways. Using bronchoscopy, a doctor may be able to identify the cause of hemoptysis. Complete blood count (CBC). A test of the number of white and red blood cells in the blood, along with platelets (cells that help blood clot). Urinalysis. Certain causes of hemoptysis also result in abnormalities on this simple urine test. Blood chemistry profile. This test measures electrolytes and kidney function, which may be abnormal in some causes of hemoptysis. Coagulation tests. Alterations in blood’s ability to clot can contribute to bleeding and coughing up blood. Arterial blood gas. A test of the levels of oxygen and carbon dioxide in the blood. Oxygen levels can be low in people coughing up blood. Pulse oximetry. A probe (usually on a finger) tests the level of oxygen in the blood. Bronchial artery embolization. A doctor advances a catheter through the leg into an artery supplying blood to the lungs. By injecting dye and viewing the arteries on a video screen, the doctor identifies the source of bleeding. That artery is then blocked, using metal coils or another substance. Bleeding usually stops, and other arteries compensate for the newly blocked artery. Bronchoscopy. Tools on the end of the endoscope can be used to treat some causes of coughing up blood. For example, a balloon inflated inside the airway may help stop bleeding. Surgery. Coughing up blood, if severe and life-threatening, may require surgery to remove a lung (pneumonectomy). People with excessively thin blood because of medication use may require transfusion of blood products or other medications to curb blood loss.